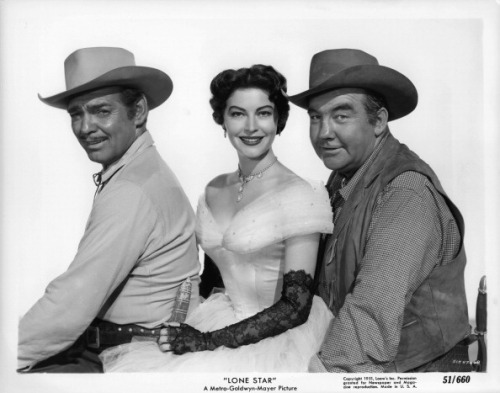 LONE STAR blew a Texas-sized kazoo in 1952, honking at both history and drama, although it’s star wattage brought in $3,922,000, enough to calm MGM executives about a $1,600,000 cost. With Clark Gable, Ava Gardner, Broderick Crawford. Throw in Lionel Barrymore, in his final role, as Andy Jackson. Heck, what could go haywire? Plenty, since the pancake-flat script plopped historical accuracy into the horse trough, and Vincent Sherman’s fatigued direction gave new meaning to the phrase “iron poor tired blood”. Dodo plot has to do with getting Texas admitted to the Union before another war with Mexico erupts. This is 1843, a scant seven years after the Alamo & San Jacinto and yet the garb, weapons, sets and attitudes are suited to times that wouldn’t arrive for thirty more. Hint to screenwriters: try just a little. Finale has two sides fighting it out when Sam Houston shows up, accompanied by some Mescalero Apaches (who, what? flew in from Arizona?) and, with bodies from their fight littering the streets, the opponents, who were just murdering each other, slap hands, yell loudly, and saddle up to go fight the Mexicans together! Nothing brings a bunch of quarreling Americans together faster than a weaker adversary they can beat the crap out of. Brod Crawford was drunk as a skunk throughout the shoot, no doubt having help tossing back a few from Clark and Ava. With Beulah Bondi, Ed Begley, James Burke, Russell Simpson, William Conrad. Whaddaya say we speed down Sunset and plow into a palm tree?